The Mayflower Hotel, located in the heart of Washington, D.C., is an ideal location for business travelers seeking luxurious and historic accommodations. President Harry Truman, who resided at The Mayflower Hotel for the first three months of his presidency in 1945, described it as, “Washington’s second-best address.” Truman’s statement not only applies to Presidents – after my recent stay I can confidently say the Mayflower Hotel is the best address in D.C. for business travelers. Since 1925, The Mayflower Hotel has been an icon in our Nation’s capital. It is the longest continuously operating hotel in the DC area. The hotel is listed on the National Register of Historic Places and has received numerous recognition for its historical distinction and architectural significance. Following a $21 million renovation last year, the hotel was fittingly rebranded by Marriott from Renaissance Hotels to an Autograph Collection Hotel. When traveling for business to historically symbolic locations like DC, I feel like I miss out on much of what the area has to offer. 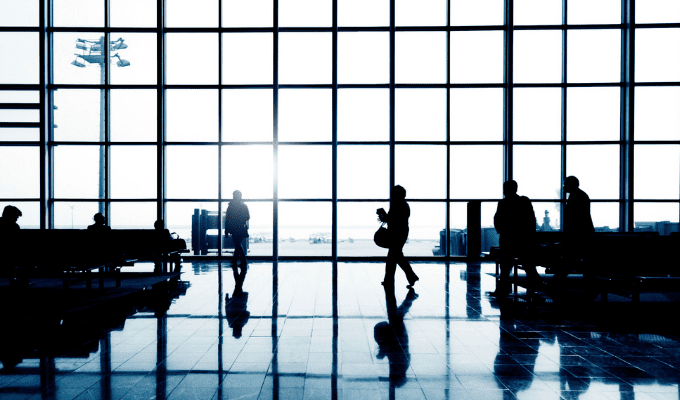 Business trips are usually short and scheduled (if not overscheduled) leaving it hard to find any time to tour the sites and experience the history. 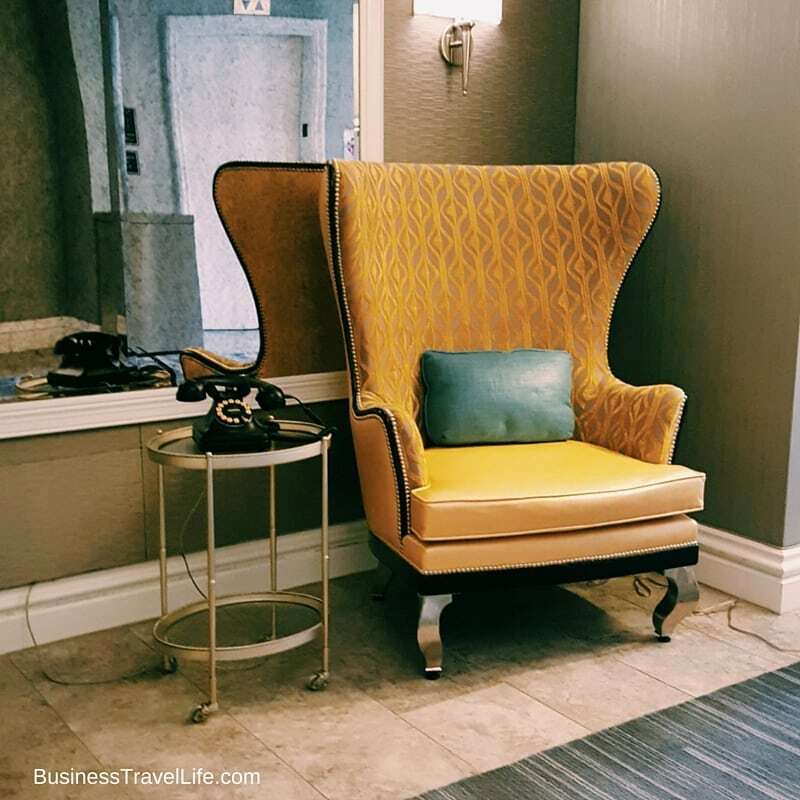 As a guest at The Mayflower Hotel, I was immersed in history throughout my stay. The Mayflower Hotel has hosted every president since Calvin Coolidge, dignitaries, celebrities, and even hosted the Inaugural Balls between 1925 and 1981. Aside from the history inside this grand hotel, the hotel’s sophisticated amenities and location make The Mayflower Hotel an excellent choice for business travelers staying in DC. The check-in process was a breeze (thanks to the Marriott app- more on that below). The check-out process was even easier. I checked out using the app, left my keys in the room, and the final bill was emailed to me. 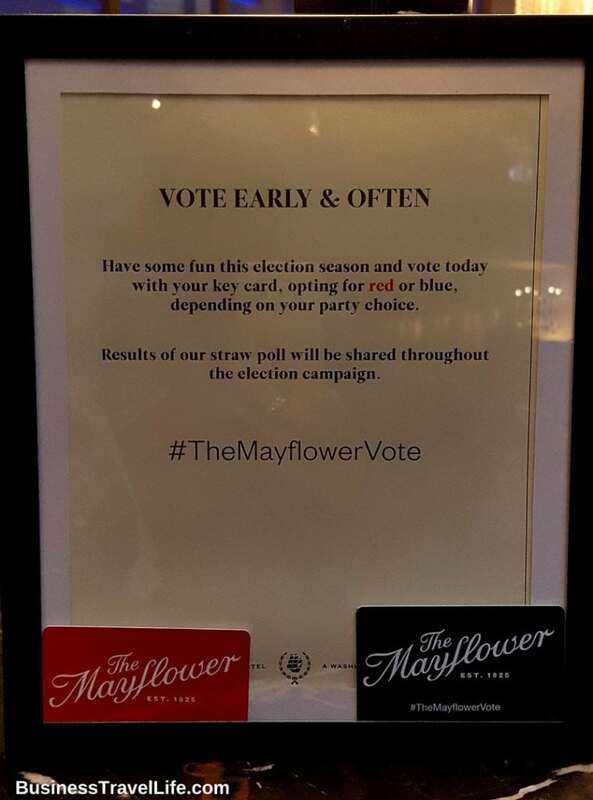 While some Marriott Hotels are using mobile keys through the app, The Mayflower Hotel does not. But, the hotel is currently allowing guests to choose a red or navy blue room key, which is more fun than using my cell phone to open the door. 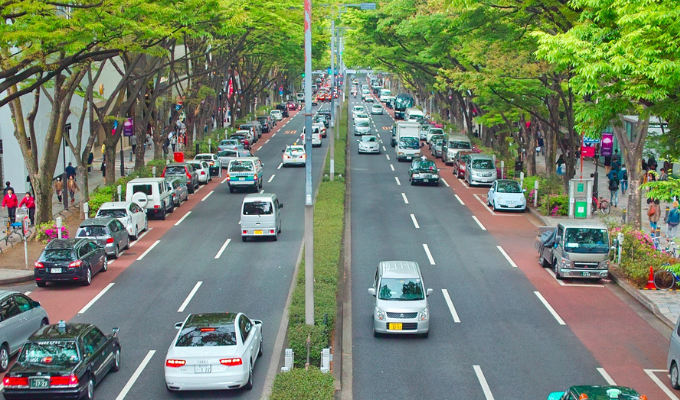 Every time I stepped out, there was a nonstop line of taxis waiting at the front doors. I am a huge fan of Uber, which was also easy to take from the front steps of the hotel. A fun way to participate in the spirit of the election. My room on the 6th floor was large and well-appointed. I had plenty of room to work and relax. The bed and bedding were very comfortable and I appreciated the variety of pillows. The chaise lounge-style couch provided an excellent location to read up on the history of the Mayflower. I was happily surprised to find a mini-fridge inside the cabinet under the desk in my room. While I did hear a few noisy guests in the hallway late in the evening, I could not hear anyone in the adjacent rooms. A look inside my guest room at The Mayflower Hotel. 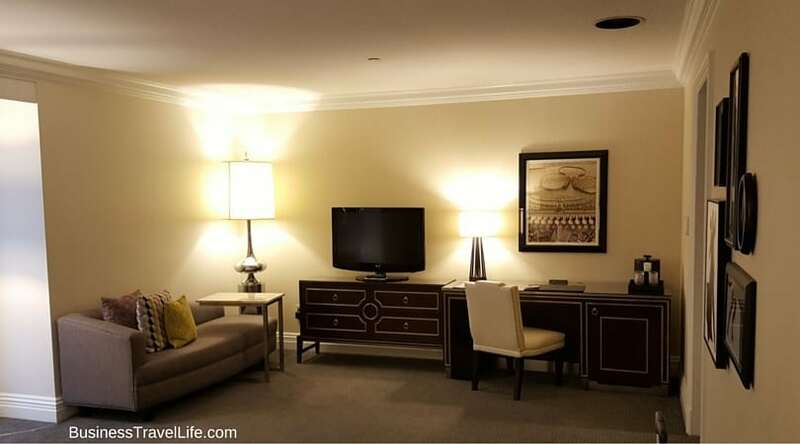 Unlike many other hotels, The Mayflower Hotel guest rooms have plenty of space to spread out and work. Standard Wi-Fi is available (complimentary to Marriott Rewards members) and high-speed internet is available at an additional cost for video streaming or large file downloading. If you enjoy getting out of your hotel room to get some work done, head to the atrium on the second floor. The atrium overlooks the lobby and has plenty of tables. The Business Center is nearby and Wi-Fi is available in this area. Plenty of space to spread out and work in my room. The Mayflower Hotel also features a UPS store on the second level and a business center. 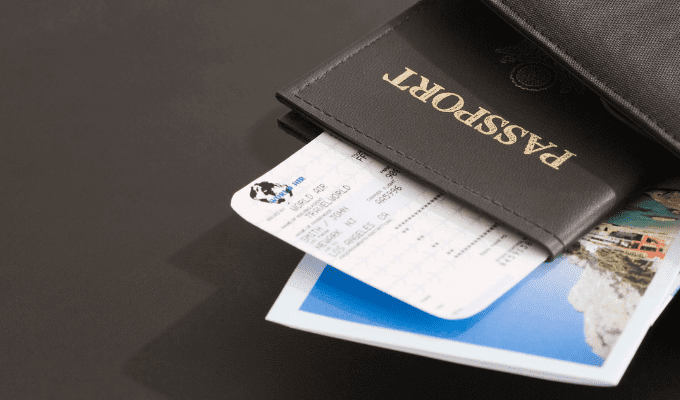 Whether you need to print, copy, ship or even notarize documents, you can do so without leaving the hotel. Other valuable business services offered at The Mayflower Hotel include secretarial services and a translator. Imagine hosting a meeting in the same space that once entertained former presidents and foreign dignitaries. The Mayflower Hotel offers over 42,000 square feet of functional meeting space, including six ballrooms and 15 meeting rooms. Fitness is a major priority for me when I travel. The fitness center at The Mayflower Hotel has its own private entrance and elevators, so you do not have to worry about bumping into your business associates in your post-workout sweaty clothes. 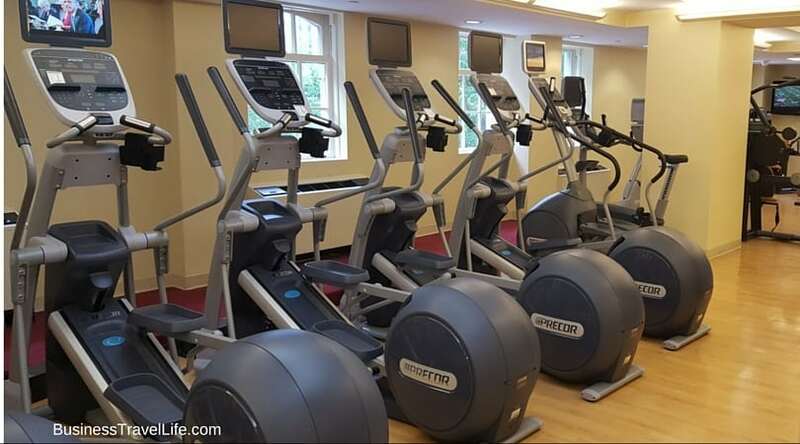 The equipment includes multiple treadmills, elliptical machines and even a stair stepper (rare to see in a hotel fitness center). For strength training, the fitness center offers a selection of machines and dumbbells (up to 60lbs.). There is enough room for stretching, and yoga mats are provided. The Mayflower’s fitness center also has private meditation/yoga rooms, which can be reserved in advance. Should you prefer to take your workout outside, there are many running routes nearby that will allow you to burn calories while sightseeing. There are multiple bike rental stations within a few blocks of the hotel. 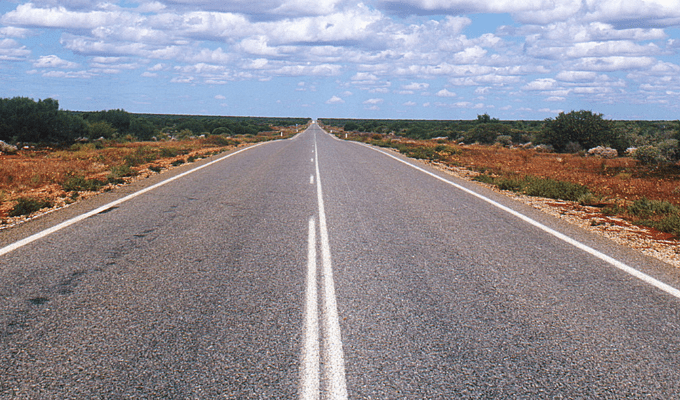 If you are short on time, you can easily combine your exercise and sightseeing. The Mayflower is only a 10-minute walk from the White House and a 20-minute walk from the National Mall. 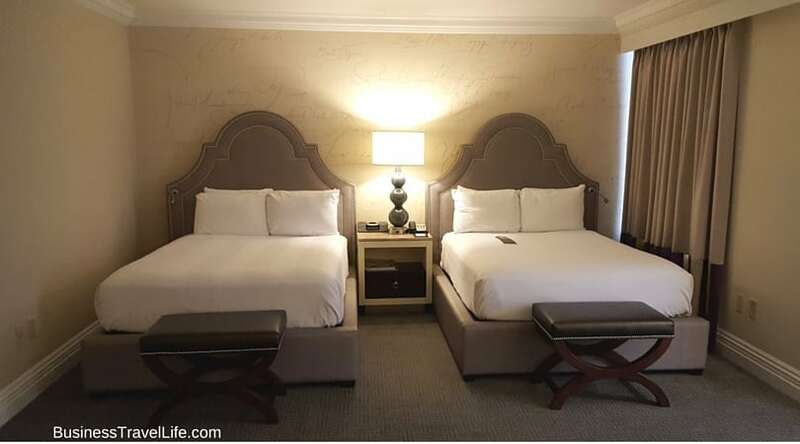 The premier location on Connecticut Avenue, makes The Mayflower Hotel centrally located to Dupont Circle and many popular DC attractions. The hotel is very close to the metro stations, only .1 miles to the Red Line (Farragut North), and .2 miles to the Blue, Orange and Silver (Farragut West). Union Station is 2.4 miles away. During my stay at The Mayflower Hotel, there was a nonstop line of taxis waiting at the front doors. I am a huge fan of Uber, which was also easy to take from the front steps of the hotel. DCA airport is 5.3 miles, IAD is 27.1 miles away and BWI is 36.3 miles away. The hotel gift shop has souvenirs, but it also sells essential toiletries and medications. I was happy to find a variety of healthy grab and go snacks and refreshments. Spilled coffee on your blouse or forgot to pack a tie? No problem. Head down to the lobby and you will see retailer Thomas Pink, which is conveniently located to the right of the front doors. The store sells men’s and women’s clothing and accessories. Named after J. Edgar Hoover, the former FBI Director, who dined at The Mayflower Hotel virtually every working day for 20 years, the Edgar Bar & Kitchen is exactly what you would expect from an exclusive restaurant in the heart of the Nation’s capitol. Featuring American brassiere cuisine and handcrafted cocktails, every meal I enjoyed at the Edgar Bar & Kitchen was delicious, and the service was outstanding. Road warriors will appreciate the plethora of offerings in the breakfast buffet and the option to order breakfast from the delectable menu. 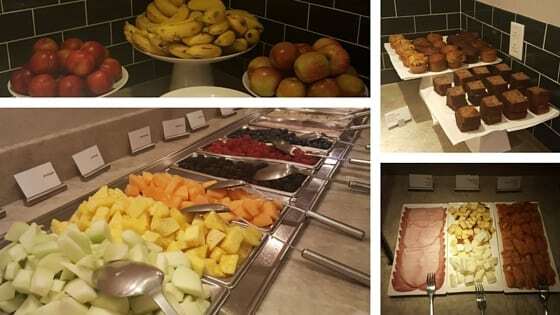 Many healthy options in the breakfast buffet. 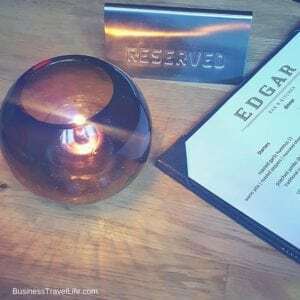 Edgar Bar & Kitchen is an excellent location to host a power breakfast, entertain clients over happy hour or treat business associates to dinner. 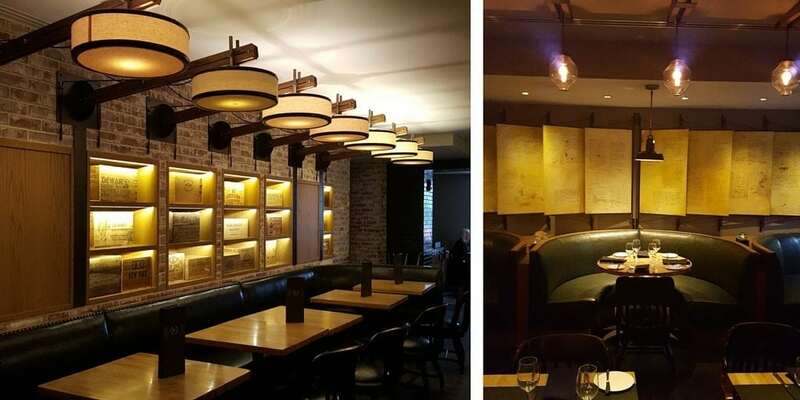 The restaurant has a private dining space for small groups, which can accommodate up to 18, while larger groups can enjoy a semi-private space for up to 50. 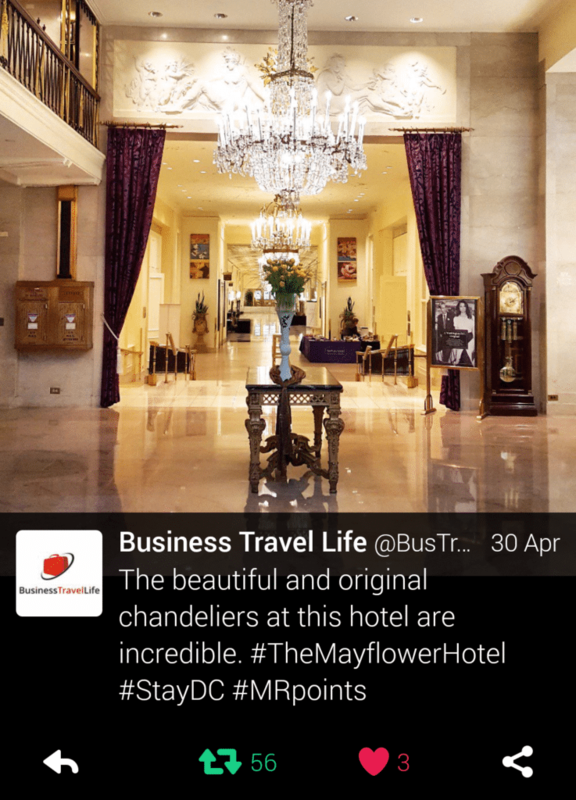 If you are following Business Travel Life on Instagram and Twitter, you may have seen our posts using #MRpoints during our stay at The Mayflower Hotel. 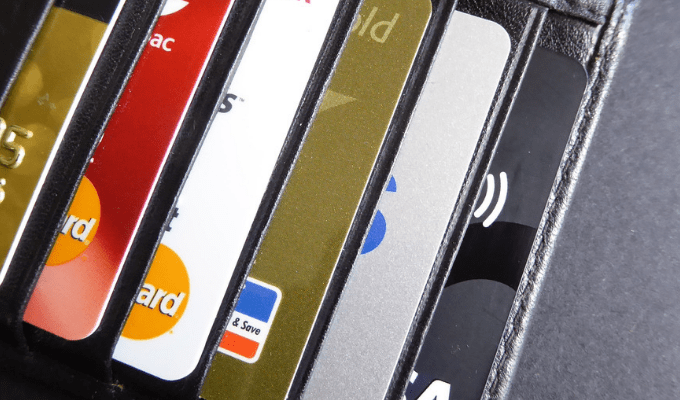 Did you know you can earn Marriott Rewards points by connecting your accounts and posting photos on social media during your stay with Marriott using #MRpoints? Pretty cool! Sign up here. I earned 25 Marriott Rewards points for using #MRpoints in my tweet! 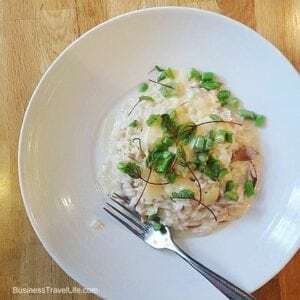 As a Marriott Rewards Member, I enjoyed many benefits during my stay at The Mayflower Hotel. I would suggest downloading the Marriott app, if you have not already, before your next stay (Google Play/ iTunes/ Microsoft). Through the app, I was able to use mobile check-in before I arrived at the hotel, and received an alert when my room was ready. 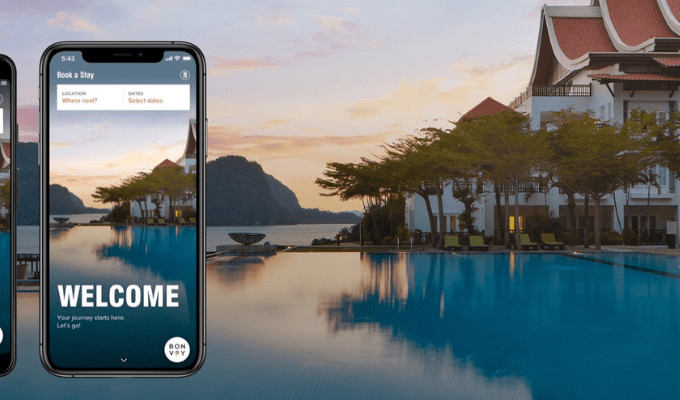 The app also has the ability, at certain Marriott Hotels (Autograph Collection ®, JW Marriott®, Renaissance Hotels® and Marriott Hotels®), to chat with a service representative to request services ranging from more towels to luggage assistance. 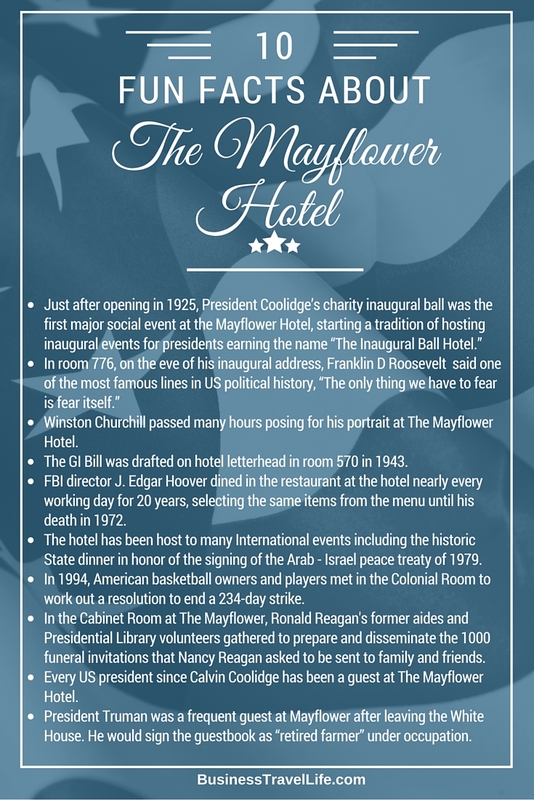 There are so many other fun facts about The Mayflower Hotel that I could have written a separate blog about the history, however, I did create this graphic to share some of the information that I learned about the hotel during my stay. Disclosure: This post was created in partnership with The Mayflower Hotel. All opinions are my own.